An idyllic setting with views over Koh Phangan and Samui’s Big Buddha, surrounded by a plethora of lush and natural tropical foliage, and framed by the ocean and the skies, Pool on the Hill is a luxurious, five-bedroom, tastefully designed holiday home for the perfect tropical getaway. 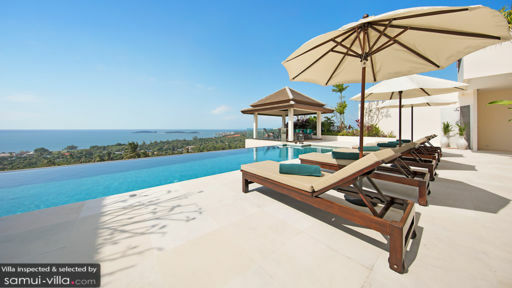 Situated over multiple meandering levels, the villa features everything from an infinity swimming pool to outdoor salas to lounge areas with games and a TV. A self-sustained, solar-powered holiday home, Pool on the Hill is eco-friendly as well providing a haven to guests where they can enjoy services like harvested rainwater showers, solar-powered appliances, and battery back-ups. 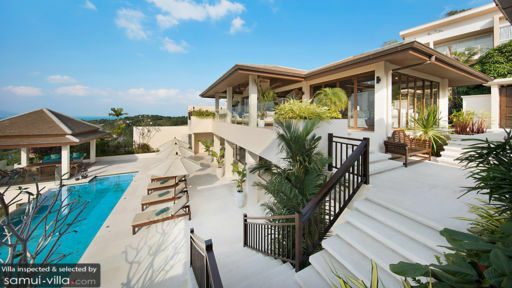 Pool on the Hill is a unique concept villa that epitomises island living in utmost luxury. With its five, lavish, and well-furnished bedrooms you know you’re in for a treat of a time. The main master bedroom at the villa features its very own lounge, a terrace, as well as an outdoor sala. The king-bedded room comes equipped with a luxurious outdoor shower in its en-suite bathroom as well. The second master bedroom also features its own lounge area as well as a semi-outdoor en-suite bathroom. Both rooms are designed with sophisticated interiors keeping with the luxurious ambiance of the rest of the villa. The three guest rooms at the villa are equally opulent with high-end design, one of a kind furnishings, and all modern amenities. For refreshing mornings and lazy afternoons, the swimming pool and deck area is the ideal spot for lounging and working on your holiday tan. The palimanan stone deck is warm and bright while you lounge on the sunbeds and soak under some tropical sunshine. The infinity swimming pool is the most amazing vantage point for sunset viewing, playing with loved ones, and enjoying blissfully peaceful mornings. A poolside sala is where you can spend memorable evenings with friends and family with a glass of wine, excellent food, and great company. As you ascend the staircase that runs alongside the pool, you will reach the furnished terrace lounge with sweeping views across the sea, fresh air, and comfortable seating. Just through the glass doors is the indoor living area that features a low, wood-finish ceiling, accent lighting, and ceiling fans for ventilation. Pristine white couches and sofas placed on local weave carpets serve as cosy sitting areas for guests to relax and unwind while making time for loved ones. There is not one but a few places around the villa including two lounge areas distinctly designed with different purposes where you can find yourself kicking back to relax and reset. The living area is even equipped with a stunning bar complete with solid, wooden bar stools where you can grab some drinks in the evening. The kitchen is state of the art with western and modern appliances to provide you with every luxury for a comfortable stay. The dining area comprises seating for all guests and there are other places around the villa where you can enjoy your delicious food. Pool on the Hill delivers even when it comes to service beginning from a pre-arrival concierge welcome to airport transfers, a continental buffet breakfast to a private chef, child-friendly amenities such as babysitting, and 24X7 customer-service. 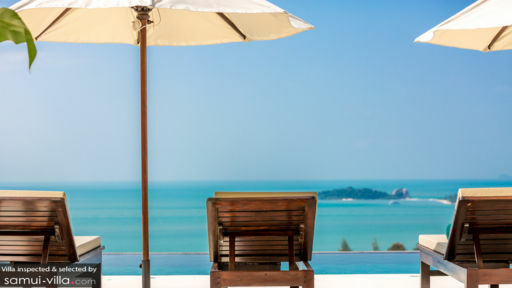 Pool on the Hill is conveniently located in one of the most idyllic and active parts of the island of Samui. Explore the nearby areas or take a boat out to visit nearby islands for an immersive experience. There are beaches, restaurants, bars, and cafes nearby for you to discover as well.